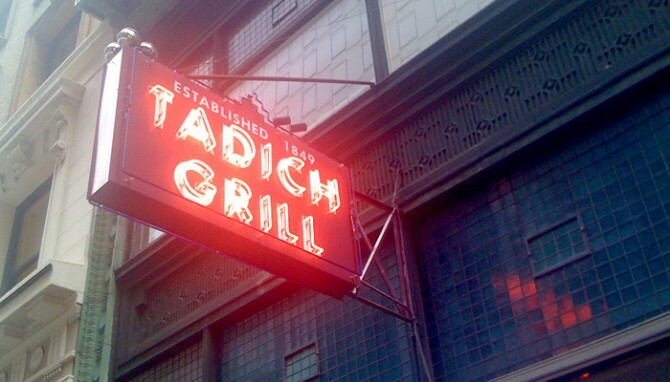 I first visited Tadich more than 25 years ago during my first family trip to San Francisco. Over the years we have returned there time after time for local classics like cioppino, hangtown fry, and petrale sole. Tadich is a San Francisco institution, the oldest restaurant in the city and the kind of place politicians and financiers meet for a late lunch or a post-work martini. It is the very definition of old-school with its white-coated servers, career bartenders who know their classic cocktails, and wood-paneled rooms perfect for a private lunch. My parents and I made our annual pilgrimage last week on a typically chilly, cloudy day. We camped out in one of the little wooden rooms for a long lunch, then wandered through some downtown buildings — we’re always on the lookout for architectural details — and finished up shopping for cheese at the Ferry Building. Food, wine, and architecture make for a perfect day! I’m not always a fan of tradition in a larger cultural context, but I enjoy family rituals like this which provide a comforting touchstone and a connection to personal history.